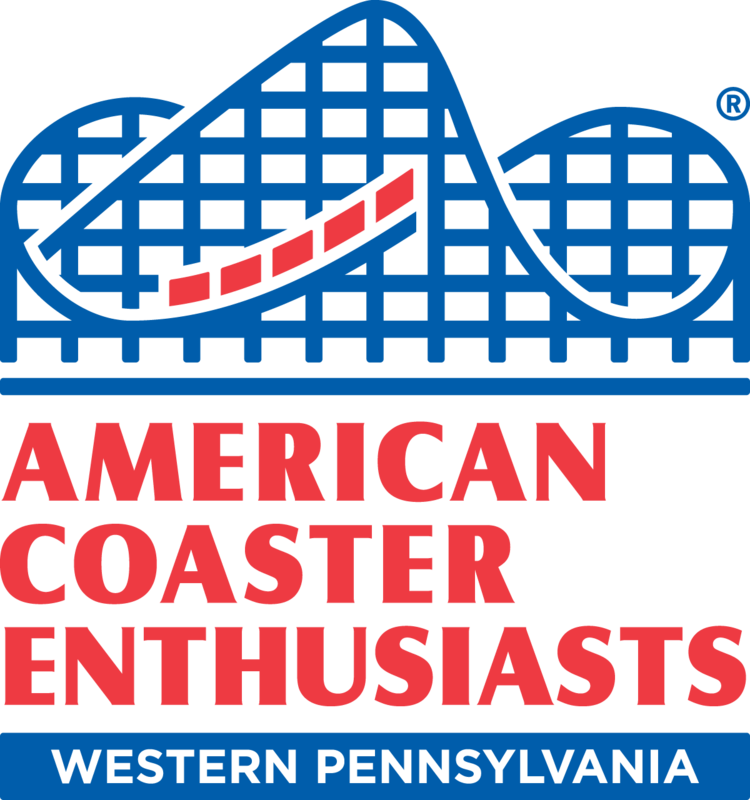 ACE Western Pennsylvania is a regional part of American Coaster Enthusiasts, an all volunteer non-profit organization founded in 1978 that now boasts over 6,000 members and works to foster and promote the preservation, appreciation, knowledge and enjoyment of roller coasters. Learn more about ACE here. ACE Western Pennsylvania is one of the larger and more active regions within American Coaster Enthusiasts. With over 300 members, many of whom are actively involved in various aspects of the organization, we are proud to represent the parks, people, and atmosphere of western Pennsylvania and its surrounding areas. There are seven distinctly different parks with coasters in our region, and several others just a short drive away. Along with his father, Bill Linkenheimer III joined ACE during Coaster Con III at Kennywood in 1980. His non-riding mother joined a few years later when family memberships were first introduced. He has attended every ACE national convention since 1988 and four prior to that. He served on ACE�s Executive Committee from 1993 to 2010 in various roles including (in order) registration director, vice president, president, immediate past president and secretary. He has also served temporarily as ACE�s public relations director on more than one occasion, was the organization�s first volunteer coordinator and the first chair of the Disciplinary Committee. He currently serves as social media manager for ACE and is a member of ACE�s Events Committee and an associate editor for both ACE News and RollerCoaster! He has been involved in the region since 1991, beginning with the creation of The Fun Times newsletter. His favorite role continues to be that of regional representative, a post that he�s held since 2002. He was the recipient of The Golden Kenny award in 1999 and the Philadelphia Toboggan Coasters, Inc.�s Manufacturer�s Award (commonly known as "The Spirit of ACE") in 2006. Other interests include traveling, food and fine dining, music and skiing. He has a Bachelor�s degree from St. Vincent College and works as general manager for Willi�s Ski & Snowboard Shops. Along with his father, Ed, Matt Adler joined ACE in 1991. His first role in the region was taking over the Preservation Fund Sales Table in 1994. He has served as editor of The Fun Times newsletter since 1996, a position that was well tailored for him after working in advertising for Pittsburgh Pennysaver for 20 years. He officially became an assistant regional representative in 2002 and currently works as a call center supervisor for Citizens Bank. Along with his wife, Maggie, Dave Altman joined ACE in 1985 after several attempts to get a membership application, which started in 1982. In 1993, Dave began helping to plan events in ACE Western Pennsylvania and has been active in the region ever since, including functioning as co-regional rep, with Maggie, from 1999 to 2002. Dave served two stints as an officer on ACE�s Executive Committee: from 2000 to 2004 as treasurer and from 2006 to 2018 as (in order) vice president, president and immediate past president. He also has been a member of ACE�s Finance Committee and was chair of the Disciplinary Committee. In addition to roller coasters, Dave is a fan of many other things on rails or that have wheels and go fast! He has been into model railroading since the age of 5 and a member of the National Model Railroad Association since 1975, having attended seven of their national conventions. He is a rail fan as well, having ridden high-speed trains in England, France, Japan and China, and was once invited inside the control cab of a French TGV train during a business trip to Paris. He is also a fan of auto racing and attended the 1985 Belgian Grand Prix and 2009 Japanese Super GT race at Fuji Speedway. Dave has an undergraduate degree from the University of Pittsburgh and a graduate degree from Carnegie Mellon University, both in mechanical engineering, and has worked for Westinghouse Electric Company since 1972, where he served as a principle engineer working on the design and testing of the internals of nuclear reactors. Dave retired from Westinghouse in May of 2017 after 44 years of service and was elected as a director of the Westinghouse SURE retiree organization in 2018. Dave was the recipient of The Golden Kenny award in 2018 and the Philadelphia Toboggan Coasters, Inc.�s Manufacturer�s Award (commonly known as "The Spirit of ACE") in 2005. Dave Hahner joined ACE in 1980 and was also involved in helping to organize some of the region�s earliest events including the first KennyKon in 1989. Since 1998 he�s been serving as the registration coordinator for the region�s events and has been a member of the regional rep team since he was officially added in 2002. Beginning in 2008, Dave has served as ACE�s historian, and he is a member of both the Archives Committee and Preservation Committee. He was the recipient of The Golden Kenny award in 2004. Also that year, Dave wrote the book, Images of America: Kennywood and in 2015 co-authored with another local ACE member, Jim Futrell, another, Images of America: Geauga Lake � The Funtime Years 1969-1995. Other interests include general amusement park history, photography, movies and local history. Ryan Lucas joined in ACE in 1994, along with the rest of his family, parents Dave and Val and sister April. KennyKon VIII in 1995 was the first event that he attended, and the ACE Summer Conference in 1995 at Seabreeze Amusement Park, Darien Lake and Waldameer was the first national event for him. Since those first events, he�s attended many ACE regional and national events including more than a dozen national conventions. Ryan and his family were collectively the winner of The Golden Kenny award in 2009. He is a graduate of Robert Morris University and loves sports. Among other duties, Ryan undertakes the enormous task of soliciting door prizes for CoasterBash! each year. Tim Michalak joined ACE in 2005. He became webmaster of ACEwesternPA.org in 2011 and redesigned the website. In 2012 he became the audiovisual coordinator for CoasterBash!, and that same year he was the recipient of The Golden Kenny award. He was officially added to the regional rep team in 2013 and later that year coordinated his first event for the region, ACE Holiday Magic (during Kennywood�s Holiday Lights). Tim has worked at Kennywood since 2001 in several capacities. He has an associate�s degree in specialized technology from Pittsburgh Technical College and his current position at the park is as a level II ride mechanic. Stephen Gray joined ACE in 2005. Originally from Dubois, within the boundaries of the ACE Western Pennsylvania region, Stephen graduated from Edinboro University and then moved to Washington, DC, in 2002 to attend George Washington University, where he earned an M.F.A. in theater design and remained after getting a job as a lighting and set designer for World Wrestling Entertainment (WWE). In 2006 he became an assistant regional representative for ACE Mid-Atlantic. In 2009 when his name came up for Pittsburgh Penguins season tickets, after five years on the waiting list, Stephen moved to Pittsburgh, specifically to the South Side so that he�d be reasonably close to the Consol Energy Center. In 2013, Stephen became the region�s Facebook coordinator, and in 2014 he officially joined ACE Western Pennsylvania�s regional rep team. Stephen travels extensively for his job but always enjoys coming home to his two cats, Harry and Hermione. He also holds a pyrotechnic license, which he once used to blow up Heinz Field during the filming of one of the Batman motion pictures. When not on the road, Stephen enjoys working at the Baierl Family YMCA in the School Age Program, teaching kids before and after school. A lifetime coaster enthusiast, Brett joined ACE on a trial basis in 2014 to attend Coaster Con XXXV at the urging of his friend. He signed up for a full membership immediately after, realizing that the friends and memories from that week were going to last a lifetime. Brett worked at Kennywood for five years during and immediately after college, first as a Phantom Fright Nights actor and then a ride operator. Brett holds a B.S. in Information Systems from Carnegie Mellon University and has been employed as a software engineer and manager since graduation. Brett�s other interests include technology, travel (especially to national parks), and Ultimate Frisbee. Brett has serviced ACE Western Pennsylvania in numerous capacities such as creating event fliers, serving as CoasterBash! assistant A/V coordinator, and managing the Fun Times. Brett was named an assistant regional representative in 2018.